I'd intended to post the second of my OSRCon 2012 reminiscences sooner, but better late than never, I suppose. 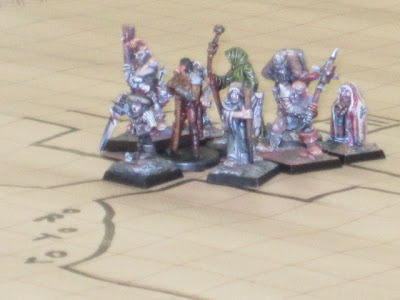 On the morning of the second day of the con, I ran Level 1 of Dwimmermount for a different group of people, including several fellow bloggers: Brendan S, Ramanan Sivaranjan, and Steve Connor, in addition to four others. As with my previous session, all the players generated their characters on the spot, using the LBBs + Supplements. 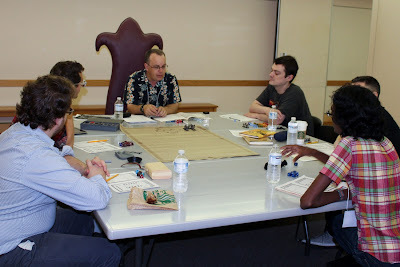 I really enjoyed this aspect of the session, both because it's fun to see newcomers try and make their way through the original edition of Dungeons & Dragons for the first time and because it's such a delightfully fast process. Generating OD&D characters at the table takes 5-10 minutes tops, even less if you streamline equipment selection through the use of utilities like this one. (That link leads to a blog post by Brendan Strejcek that, at the time, I somehow didn't connect with him, so it led to the amusing situation in which I recommended its use to its creator without realizing it). A joy unique to con play (and, to a lesser extent, Google+ hangout games) is watching different people explore the same stretch of the dungeon. 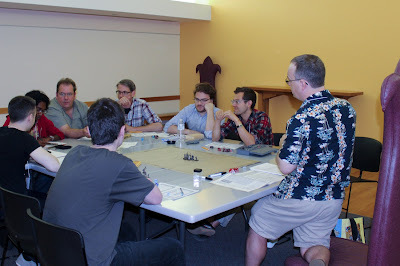 The differences in play style and approach become readily apparent when you play sessions temporally close to one another, as I did at OSRCon. Whereas the Friday night group was rather cautious, even timid (with the exception of Ken St. Andre's berserker magic-user), the Saturday morning group was much more bold. Indeed, they seemed to relish poking, prodding, and generally trashing Dwimmermount in order to determine how everything worked (or didn't, as the case may be). The differences between the two groups highlighted for me that dungeons (and adventure modules in general, I suppose) can't be used in just one way. 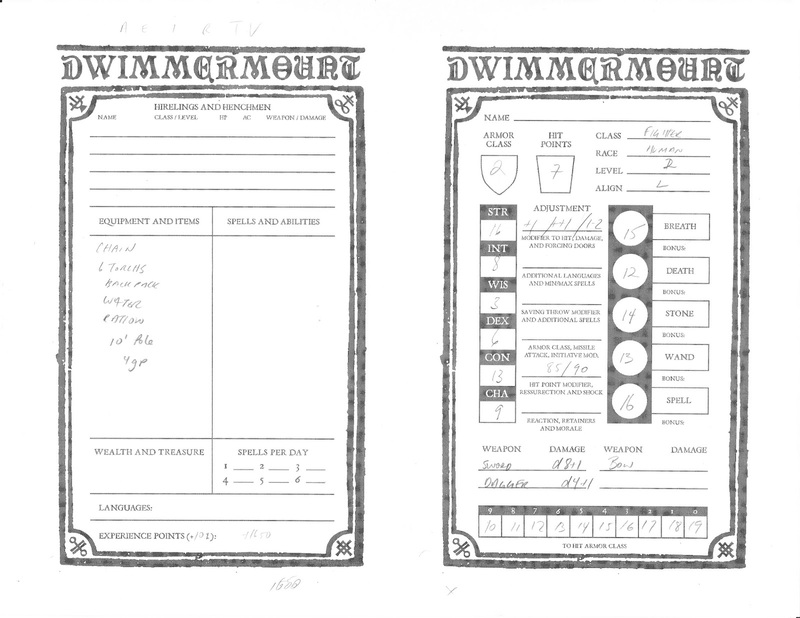 Everyone approaches them from their own perspective, which makes the task of producing a "definitive" version of them difficult -- especially since I find that I adapt my own presentation of Dwimmermount (and even its contents in some cases) in response to the actions and expectations of the players. To one group of players, a room whose description -- if it has one -- reads "Former guardroom; wooden debris" is something quickly passed through and forgotten, but to another it's a source of endless fascination, investigation, and experimentation. For the latter group, I often make up details on the spot, details that, if I like them, eventually become permanent parts of the dungeon for future adventurers to find, should they ever make the effort of looking for them. 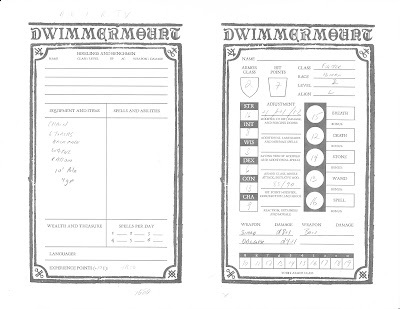 The other thing that stands out about the second Dwimmermount group is that they actually ventured down into one of the second levels of the dungeon (there are two). I purposely had the players in both groups generated 2nd-level characters in the hopes that, not only would they survive longer, but they'd be better positioned to take on lower levels. So, I was quite pleased when this group did so, since, fond as I am of the 1st level, I've run it a lot over the years, whereas the lower levels are much less well explored, even by my home group. Indeed, there's a lot of the dungeon no one has ever visited. 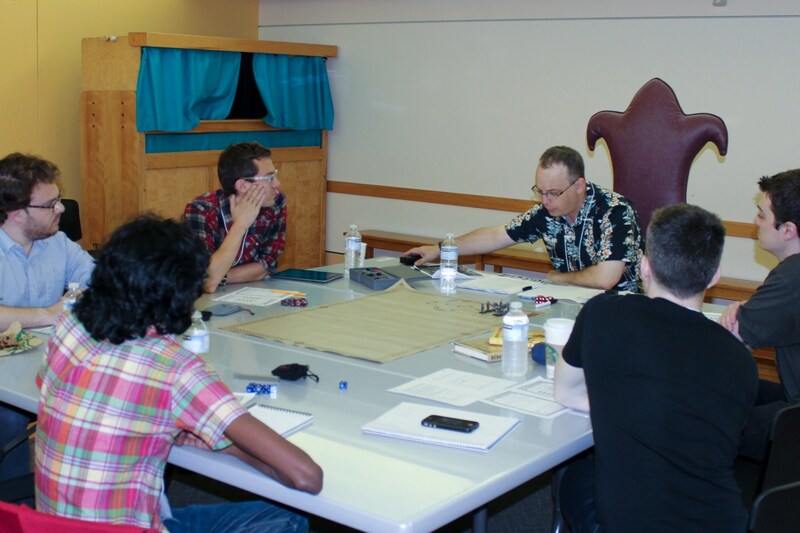 A final difference between the two groups is that the Saturday group discovered a pretty valuable magic item hidden behind a secret door -- a tome of clear thought. In my mind, I had confused the tome with the manual of puissant skill at arms, thinking that, instead of granting a +1 bonus to Intelligence, it increased the level of the magic-user who read it. Consequently, upon being discovered, the two magic-users diced for possession of it and then elected to leave the dungeon for a time to give the winner a chance to read it thoroughly. The rest of the group healed and re-equipped and they returned with a 3rd-level magic-user in their party. Aside from my obvious screw-up, this was interesting to me, since most con groups don't bother with leaving the dungeon for any length of time, instead forging ahead regardless of the cost. I found it a smart decision and so saw no reason not to allow it. Plus, it gave me a chance to use my dungeon restocking tables. It was another good session and a reminder of the unique joys of playing with strangers, something I hadn't done since I was a youth, back in the ancient days when it seemed like D&D games broke out spontaneously whenever three or four kids were in the same place for any length of time. I highly recommend the experience, particularly for referees. Thanks a lot this write up and the pictures. I cannot wait myself to start running your Dwimmermount myself. And gorgeus miniatures, very well painted! I've been interested in dungeon re-stocking for a while now, but there seems to be a dearth of advice about it on OSR blogs. Since you mentioned that you use re-stocking tables, would you mind making a post addressing how you re-stock dungeons some time? Do all GM's get that cushy throne? I'd just use the wandering monster tables, perhaps a tad bit modified. And, of course, you can always use the random dungeon generation bits in the rulebooks. Just roll some D6s to check the probability of new traps, treasure, or monsters, or unique features. Yeah, this is what I do. Restock using the standard d6 probabilities, using the dungeon level random encounter chart, or picking something if it feels particularly appropriate. (Like perhaps being taken over by a rival dungeon faction.) I don't have a set schedule, but two sessions (or up to a month of in-game time) is what I usually use. The photo really doesn't do them justice. I thought they were some of the nicest paint jobs I have ever seen. Seemed really unique. Thanks. That's helpful. Out of curiosity, how might you modify a wondering monster table while re-stocking? Additionally, consider what might be in the area that the previous monsters were keeping out. If you kill all the Orcs, the neighboring necromancer might raise them all as zombies. Or surface wildlife and vermin might move in. Thanks! Re-stocking on a schedule instead of as rooms are cleared is a really helpful idea to me. It makes a lot more sense, in-game, for every megadungeon except one that leans really far into being a mythic underworld; it also avoids the problem that was bothering me where, if I only re-stocked rooms that the PCs had cleared of monsters or traps then more and more rooms would, when I rolled, come up empty and then, if the PCs cleared an area out over and over again, eventually become empty. Re-stocking all rooms in general areas they've cleared out on a schedule completely avoids that issue. An excellent game. And I'm glad you saved my character sheet. I was wondering what happened to 'Boldo the Impetuous'! I very much look forward to Dwimmermount, if only to learn the secrets we missed.